Rugby Town are hopefully back on the up again now, after securing two much-needed victories over the past week. Valley’s 5-3 success at Haughmond at the weekend was their first MFL win in five attempts and they followed this up by beating bottom placed Shawbury 2-0 at Butlin Road on Tuesday to restore themselves to the top half of the table. Dave Stringer’s side will be looking to make it a treble this weekend with another home game against Lye Town – a fixture which will represent a trip down memory lane for the more longstanding of the club’s fanbase. The two teams faced up to each other 16 times over Rugby’s eight-year stay in the West Midlands Regional League between 1975 and 1983 – meeting for the last occasion just over a fortnight before Valley’s famous success in the FA Vase Cup Final. They played out a 0-0 draw in front of 232 spectators in that April 1983 fixture, although the Stourbridge-based outfit comfortably came out on top on the overall head-to-head record with 11 victories in that timespan. Having started this season well by following up an unbeaten pre-season campaign with four wins and two draws from their first six league matches, Lye have since been on a terrible run – recording just one more three-pointer from their subsequent 11 outings. The Black Country side therefore now sit down in 14th place – four points and four places behind Town, and they will be looking to kick-start the season at Butlin Road on Saturday, after an impressive 2016/17 term which saw them end up in fourth place. 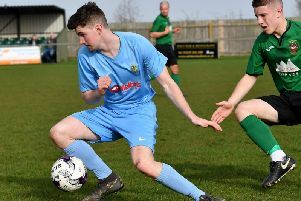 Rugby may be without the injured Craig Kelly again at the weekend, after the full-back was substituted towards the end of the first half at Haughmond. His midweek replacement Trey Brathwaite also limped out prematurely against Shawbury, so with another full-back Jamie Hall set for a switch to ex-Valley boss Dale Belford’s new club Hinckley, Stringer’s resources in that position may be somewhat stretched. Ruben Wiggins-Thomas took his tally to eleven goals in fourteen league appearances following up on his brace at Haughmond with an 80th minute game clincher on Tuesday evening, although the striker did miss a second consecutive penalty before that late strike. Town’s scheduled local derby at Coventry United a week Saturday (2nd December) has been postponed due to the hosts continued participation in the FA Vase, meaning Rugby’s next two league matches will also be at Butlin Road against Heanor and Boldmere on the 9th and 16th of December respectively. # The club will once more be collecting food, toiletry and underwear items for the homeless in the run-up to the Christmas on behalf of local charity Hope 4. Valley Vice-President’s club representative Tony Mann – who is co-ordinating the collection for the Newbold Road based operation - is hoping that the initiative will again be well-supported on the back of the previous successes.